Approved Document N of the UK Building Regulations covers the rules and regulations surrounding glass and glazing and in particular safety in relation to impact, opening and cleaning. It ensures that any glazing accessible to persons in a building is shielded from the possibility of impact or resistant to impact if a collision occurs. In the event that impact causes breakage it should be ensured that the glass breaks in such a way that no injuries are caused. Document N also states that where transparent glass is present it should be made apparent. Also included are details on how windows, sky lights and ventilators should open and close safely and also what access and facilities should be provided to make sure glass can be cleaned in a safe manner. 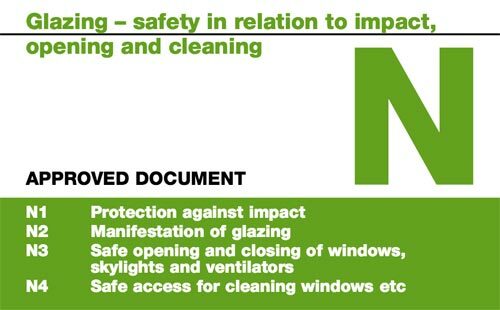 The purpose of Approved Document N is to deal with glazing and the safety aspects involved when it comes to impact, opening and cleaning. 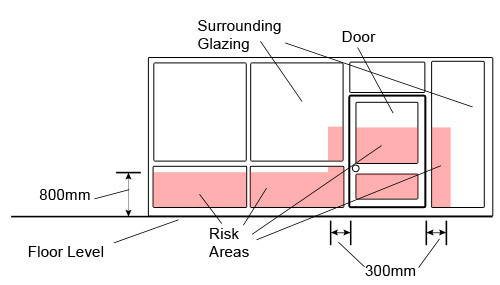 What this essentially means is that where windows and other glazed surfaces are present, they should be safe for any passing pedestrians or inhabitants of a dwelling in so much as if breakages occur then the resulting glass should be contained as much as possible, any risk of impact with a glazed surface should be minimised as much as it can be, windows and skylights should open safely and the glass itself should be possible to be cleaned as easily and safely as it can. The first point to deal with here is the "Critical Location". This refers to an area where the risk of injury is at it’s greatest. When dealing with doors this is recognised as being glass panels and glass side panels in doors and glass that features at lower levels within walls and partitions. When concerned with doors, the risk areas are identified as those between floor and shoulder height and those around the handles and push plates. In the unfortunate event of breakage in this scenario the hands, wrists and arms are the most vulnerable followed closely by the body area as if a person puts their hand/arm through a glass area this my cause them to loose balance resulting in their whole body falling through, with many more injuries involved. When putting "best practice" into place and ensuring that in the event of breakage injury risk is as small as possible, the best solutions are to ensure that the results of a breakage leave only glass particles that are harmless or sharp edges are masked (conforming to BS 6206:1981), to make sure that any glass panels themselves are resistant to impact and will not break or to prevent contact altogether by cordoning off any exposed glass areas. For example it is quite common place these days to see large glass screens and doors (such as bi-fold doors, patio doors etc…) in both domestic and industrial settings. Due to the nature and style of some of these items, when positioned in situ, it is not always obvious that they are actually there which can mean if someone is rushing about and not necessarily concentrating on what’s around them they can easily walk straight into a glass door, wall or partition. The above is mainly geared towards doors and entrance points but you also have to be aware that large and transparent panes that form walls or partitions need to be indicated in a suitable manner. This can be achieved by adding pattern markings, solid or broken lines or company logos at a suitable height to indicate their presence. As we are dealing with windows here certain elements of Approved Document K also come into play. It is stated that where there is a risk of falling through or out of a window that is above ground level then and opening windows should be restricted from fully opening. We all know that windows get dirty and with this in mind it also has to be ensured that any window can be safely cleaned. The regulations state that both sides of a pane of glass should be able to be cleaned safely where there is a risk of falling more than 2 metres. As with anything relating to the building regulations, Approved Document N is no exception – you must ensure that you are referring to the most correct and up-to-date document! With this in mind the above notes should only be used as a guide and you should always refer to the downloadable Approved Document N available from the Planning Portal website on the link at the top of this page for the most relevant building control guidelines.